Some irisarians, as recently as just the other day have described this iris as 'A poor grower', which is a bit puzzling really when you think that this iris is still strutting its obvious good looks some 80 years after its introduction. 'Missouri' is one of those irises that decides for itself if it likes growing in your garden, fortunately for me it likes growing at our home. It needs to be grown where conditions suit the plant not the grower. My plant came from an importation about a decade ago to New Zealand just before importing irises became impossible and is still growing in the same position with no fuss. 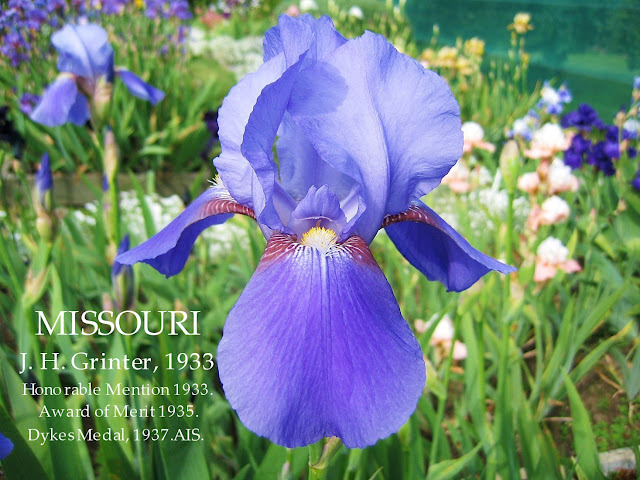 When 'Missouri' was introduced in North America it almost exclusively became a Champion only in the Northern America region and in hindsight it does not appear to have been widely distributed in the Southern Hemisphere at all and made only very few appearances in the Catalogues of European commercial iris growers. Perhaps it had something to do with World War II. Its an iris with blooms of heritage form, and tall stems. Fertile both ways and became a great parent in the 40's and 50's. Fragrance noted in the AIS checklist 1939, as Strawberry and Lilly of the Valley ( I can't recall this fragrance fantasy). Still immensely admired today and an iris with History +. AIS Bulletin #66, September, 1937, '1937 Iris Notes', page 10, Charles and Agnes Whiting. 'Far West', warm and mellow in its sunset tints, proved true to its natural color picture, as did that grand blue, Missouri. Recent developments in color photography and printing have given wonderful results and opened up undreamed of possibilities, and the day of imagination in color plates is over. A fine clump of Missouri almost dominated the latter part of the season in our garden; a fine iris, well deserving of its wide popularity. The picture on page 7 (see below) shows its magnificent form and poise, but unfortunately not its color. May the time soon come when we can have natural color plates in our BULLETIN. AIS Bulletin #66, September, 1937,'Impressions of a California Iris Season', page 54, Harold I Johnson. Missouri appealed to me as being one of the best looking irises I have ever seen. The stem is tall, the branching perfect, and the flower-substance and form place it right along with Shining Waters as one of the finest of the blues. AIS Bulletin #67,October, 1937,'Variety notes submitted by Accredited Judges', Page 28,W. M. Kellogg,Compiler. Carl Salbach, Berkeley, California, Iris and Selected Seed Catalog, 1937. The Iris Society Year Book (BIS), 1938, "Presidents Survey", page 53, G.L. Pilkington. MISSOURI (Grinter) - This I am disappointed in. The flowers are of good form and size and the colour is a clean mid-blue, the falls being a slightly deeper shade than the standards. Here it has never exceeded 2 ft. and it is clear that it is not "at home". Cooleys Gardens, Silverton, Oregon. Iris Catalog, 1938. MISSOURI. Clear, clean blue, of sensational size. There has never been sufficient stock to supply the demand for this iris, declared by some observers to be the last word in its color. 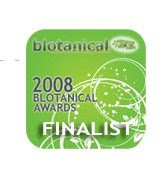 Very few plants.Dykes Medal 1937. Schreiners Iris Garden, Riverview Station, St Paul, 7, Minnesota. An iris Lovers Catalog, 1940. MISSOURI. (Grinter '33) M. 37". We have always regarded this variety as one of the classics of irisdom. The giant blooms of faultless form and heavy enamelled texture are a clear rich shade of medium blue. In every way a splendid iris. The Iris Yearbook (BIS), 1949. Bearded Irises in Blue Shades, C. P. Raffill. MISSOURI (Grinter 1933). This is an old iris compared with the preceding varieties, but is well worth its place in the garden, for its lovely silvery shade of light blue with perfect form and texture ; and the whole plant is vigorous and free flowering. National Iris Gardens, Beaverton, Oregon, 26th Catalog, 1942. MISSOURI. (Grinter 1933) ML. 37" Dykes Medal 1937. A giant of clear blue in color. The broad flaring flower are of enamel-like texture. 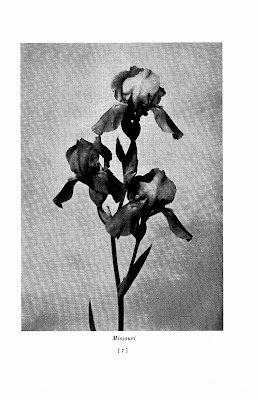 Tells Iris Gardens, 691 8th North, Provo, Utah, 1951 Iris Catalog and Hybridizers Handbook. MISSOURI (Grinter '33) M-L (Sensation X Blue Ribbon) Medium deep blue with brown on hafts.Dykes Medal '37. MISSOURI TB 40" M B3M (Grinter 1933); Pat. 1933 (Quality Gardens). Stoner 1933 (Tip Top Gardens). Kellogg 1934. Schreiner 1939. (BLUE RIBBON X SENSATION); H.M., A.I.S. 60; 66; Feb 1936 ☐ str. ly. val.